A recent campaign success story for Feeding America could shed light on how consumers are using devices and which publishers are actually driving traffic. Working with the Ad Council and Facebook's Atlas measurement platform, the Chicago-based nonprofit launched an eight-week digital campaign this spring to drive donations and volunteer sign-ups. 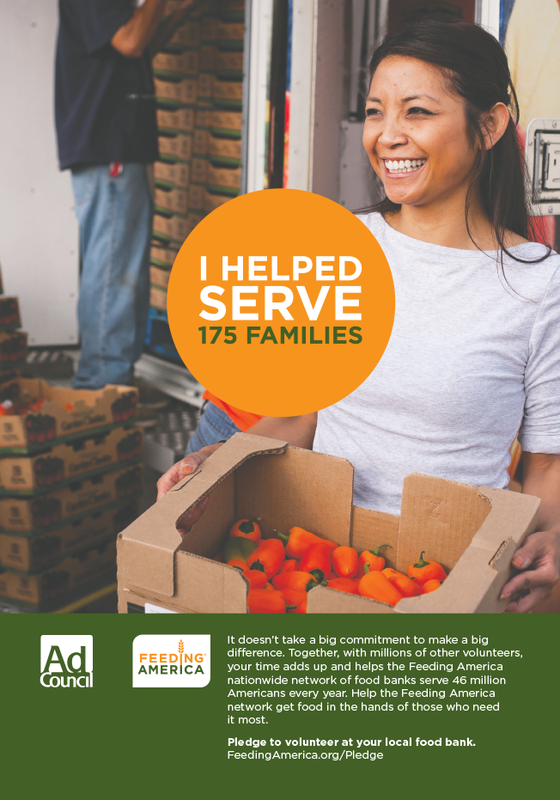 Ad Council—which partners with U.S. creative agencies, media outlets and others to come up with ad campaigns for dozens of social causes—worked with the largest network of food pantries in the U.S. to come up with a campaign that had key performance indicators that would be good proxies for other marketers as well. According to Beth Ellard, evp of media at the Ad Council, the campaign also helped provide insight into what works and doesn't work for a cross-device campaign. "One of the things we were very interested in understanding here is how the target audience is using devices, because they really mirror what is happening with consumers in terms of going across devices, platforms, channels, etc.," Ellard said. "And the ability to attribute donations and volunteer sign-ups more clearly was a big opportunity here and to be able to understand the individual properties—both Facebook and off Facebook—to better understand how to optimize media partner performances." As a result of the campaign, Feeding America saw attributable donations increase by 31 percent and attributable sign-ups increase by 649 percent. By analyzing in real-time the publishers that underperformed, Feeding America and the Ad Council realized they could increase donations by another 2.6 percent by moving spend for the bottom eight publishers to the top five. "Because we were using this people-based measurement platform, we're really able to understand going forward our creative, our targeting, our messaging, etc," Ellard said. "Instead of those donations just being out in the ocean, we knew they were attributable to this specific campaign and these specific people … This is huge to really be able to understand how to motivate and track volunteers for Feeding America." Atlas and the Ad Council were able to see which publishers were driving the best—and worst—results. In fact, of the publishers that donated digital space for the ads, the top five drove 98.6 percent of donation completions, 85.2 percent of donation starts and 96.6 percent of all volunteer sign-ups. According to David Jakubowski, Facebook's head of ad-tech, Atlas looks at which ads connected to the people who donated or volunteered and which chain of publishers they ran on. "Prior to this technology, when an advertiser ran a campaign, they'd put money out and then say 'OK, how successful was this?'" Jakubowski said. "Then they would look at each of the channels, each of the publishers that they ran on, and say, 'Which one drove the most bang for my buck? Where would I put it and why?'" The campaign also helped inform which demographics responded best. Women drove the most conversions, especially in three key age groups: Those over 65 years old, 55-64 and 45-54. Men aged 18-24 and 35-44 had the highest average donations. According to Jakubowski, understanding which demographics resonated allows for better decisions on which publications to focus on. "If you overlay the demographics over the geographic breakouts of where the ads ran, you see that right smack in the middle of the country, the conversion rates were lowest and were highest kind of on the coasts," he said. "So we could say in the middle of the country we want to drive more education about the program of what Feeding America does and what people can do to get more involved, and on the coasts we can go right for calls to action—donate, volunteer, get involved—where the awareness appears to be higher." For the Feeding America campaign, Atlas found 37 percent of the conversions began on mobile by seeing an ad, before finishing on desktop with a donation or a sign-up. However, another 56 percent began on mobile and ended on mobile. "We're talking about half the people are crossing experience, which means for a marketer not using the system, half of those conversations would be considered magic," he said. "They just happened organically, and the campaign actually gets no credit for it."